The game is supposed to showcase the Wii U's GamePad controller; it features a second screen which will allow players to view the inside of Fox McCloud's cockpit for the first time. Players will aim their ship's weaponry with the GamePad's motion controls, while using more traditional controls to steer their craft. Miyamoto has admitted that this control scheme may take some getting used to, but he estimated no more than around half an hour for most gamers, and that gamers will soon see the advantages of this method of play. Nintendo is also introducing a new vehicle type to the games based on a helicopter. Nothing whatsoever has been released about the story of the game or which of the franchise characters will appear, with only Falco Lombardi incidentally confirmed by a photo from the Time article. Miyamoto has also been working on two other games utilizing the GamePad, Project Guard and Project Giant Robot, which may become part of the Star Fox game, remain separate entities from the franchise or even remain separate games within the Star Fox franchise. "Hold still and let me shoot you!" goes back to at least Carl Barks and his Donald Duck comic book "The Sheriff of Bullet Valley" in 1948. Is this its earliest usage? Well,I guess I finally have a reason to replace my Wii with a WiiU now. To me, I only count the first two Star Fox games as a classic, which was for the SNES and the N64. I liked the way you had to fly through planets and then beat a boss and such. I'm kind of unsure if the new one's going to be like that, or just another mission game.. Maybe it's going to be both? Star Fox Adventures was good for it's own special type of game (Except for the "can't go back part" near the final boss). However, I wouldn't mind if it's that again if the they made a new classic sequel first after many years. Like a side spin-off. Edit: Turns out there was a third one called Star Fox Assault, I just saw a video and it looks like a classic too I think. Never had it, and I thought the name of that was that DS one I've had once? Star Fox Assault was like Sonic Unleashed... only worse. The first level was awesome, then it went down hill like barrel roll (The Lord of the Rings kind; not the Star Fox kind). It's like "This is how the whole game could have been"; and then, "Haha, just kidding." It was mission based. You could play 10 levels in the order it wanted you to at varying challenge levels. That was it though. 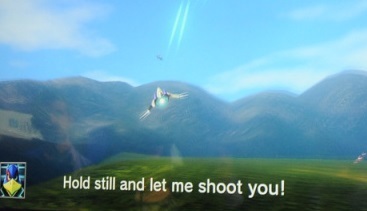 Oh man, then never mind on Starfox Assault I guess. xD The video I saw was the beginning anyway I think. Hopefully it won't be anything like quick fast missions only. I LOVE STARFOX!!!! I have every star fox game!!! i had an idea that fox eventualy finds his dad and they re-unite somehow. that would be awesome.